CP All Plc. (the “Company”) was established in 1988 by the Charoen Pokphand Group.The Company is the sole operator of 7-Eleven convenience stores in Thailand, which has been granted an exclusive right from 7-Eleven, Inc., USA to conduct business under the Area License Agreement.In 1989, the first 7-Eleven outlet in Thailand was opened on Patpong Road. Top 10 Thailand’s Most Innovative Companies 2009 Award, which was ranked by Faculty of Commerce and Accountancy, Chulalongkorn University and Krungthep Turakij newspaper. Best CEO Award for a SET-listed firm 2010 presented by the Stock Exchange of Thailand and Money and Banking Magazine. Best CEO Award and the Best CFO Award in the Service Industry at the SAA Award for Listed Companies 2010 presented by the Securities Analysts Association. Recognized by Forbes Asia Magazine as one of the 50 best biggest listed companies in the Asia Pacific Region in 2011 (Asia’s Fab 50 Companies). Top Corporate Brands 2011 in the service sector in Thailand by Marketing program, Chulalongkorn University’s Faculty of Commerce and Accountancy. Gold Award for Retailers in Thailand Presented by Retail Asia Magazine in Partnership with Euromonitor International and KPMG at the “Retail Asia-Pacific Top 500 Ranking 2011 Awards” for the second time consecutively. Asia’s Fab 50 Companies by Forbes Asia Magazine as one of the 50 best biggest listed companies in the Asia Pacific Region in 2012 for the second time consecutively. Top Corporate Brands 2012 in the service sector in Thailand by Marketing program, Chulalongkorn University’s Faculty of Commerce and Accountancy, for the second time consecutively. 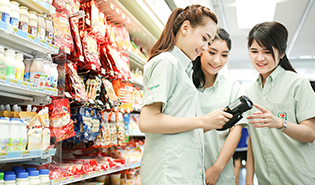 Gold Award for Retailers in Thailand Presented by Retail Asia Magazine in Partnership with Euromonitor International and KPMG at the “Retail Asia-Pacific Top 500 Ranking 2012 Awards” for the third time consecutively. Best CEO Award and the Best CFO Award in the Service Industry at the SAA Award for Listed Companies 2012 presented by the Securities Analysts Association.